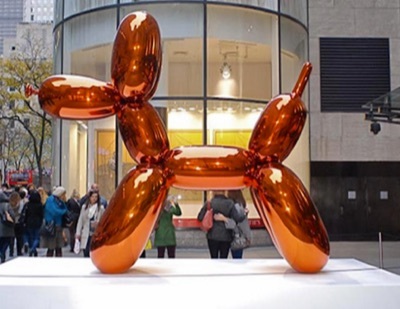 This is ‘Balloon Dog (Orange)’, a sculpture by New York ‘appropriation artist’, Jeff Koons. It’s constructed from colored, mirror-finished stainless steel. In 2013, this piece sold for more than $58 million – the current world record for an artwork sold by a living artist. Mr. Koons has a made a glittering career playing with themes of the ‘banality of modern life’. It strikes me that Jeff thinks about ‘banality’ quite a lot for a guy with enough money to BUY Disneyland! 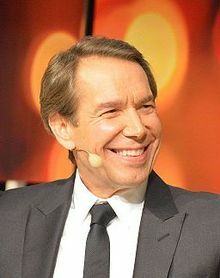 Jeff Koons also has a habit of getting sued for plagiarism – he’s had three significant court cases to date. While he arguably has a set of problems specific to a millionaire appropriation artist, there are probably some useful lessons for us here too. Today I thought we’d focus on his first copyright case – the sequels are never quite as good, right? Back in the early-90’s, photographer Art Rogers sued Jeff Koons for infringing Rogers’ photo titled ‘Puppies‘ (1985) – a black and white image used mostly on greeting cards and postcards. 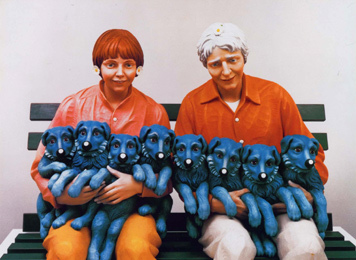 Koons created his ‘String of Puppies’ sculpture series in 1988 and later freely admitted using Rogers’ photograph as the basis of the work. Fair use: the legal, unlicensed citation or incorporation of copyrighted material in another author’s work under a four-factor test. Parody: an imitation of the style of a particular writer, artist, or genre with deliberate exaggeration for comic effect. Why Couldn’t Koons Claim ‘Fair Use’? We hear the ‘fair use’ concept cited often on the web. In fact, there’s an often quotes belief that a 20% change from the original work is enough to protect you. There is no truth to that idea. How would you even begin to measure it? Koons changed media, added colors, flowers, strange dog noses and even the modelling itself isn’t a particularly close replica of the photo. But that still wasn’t enough. There are two main parts to determining whether copyright has been infringed. Firstly, can the original creator prove it owns the rights to the work? Art Rogers certainly owned the original photo rights. The second part asks whether the ‘average person’ viewing the work would recognize that one was copied from the other. It’s hard to imagine anyone believing Koons’ composition was random chance. In short, changing the media and some detail is no shortcut to a fair use defence. Why Couldn’t Koons Claim ‘Parody’? On the surface of it, parody seems like a reasonable defence. After all, Koons is supposedly making a comment on society. Unfortunately, the court didn’t buy this defence either. Paraphrasing the court ruling as best I can, parody needs to be making fun of the item it is parodying. In other words, I’m free to parody Lady Gaga in a Lady Gaga video. But as Koons was poking fun at modern life, in general, rather than directly at Art Rogers’ work, the court wouldn’t allow the parody defence. They reasoned that any number of other equally ‘banal’ photos could have been used instead of the puppies. As strange as it sounds, if Rogers’ photo had been more famous – had it entered the public consciousness like, for instance, Demi Moore’s Vanity Fair cover – Koons may have had a better case (note: I am not a lawyer). 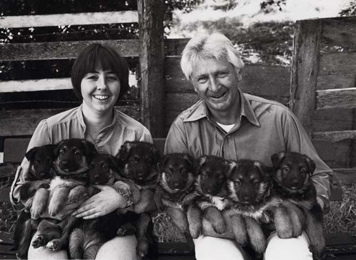 Interestingly, when Rogers won the case he received one of the four ‘String of Puppies’ sculptures produced – along with a sizable cash settlement. That sculpture was valued at $400K back in 1992. Who knows what it is worth today? Ironically, Koons probably could have had an assistant license the ‘Puppies’ photo for $50. I guess the lesson is: If you’re a big-shot artist, don’t be a cheapskate. But then again, maybe the Rogers court case was just another PR whistle-stop on the way to Koons becoming the ‘$58-Million Man’? Maybe everyone’s a winner, baby!